Every week, someone will win a delicious O&H Danish Kringle of their choice, shipped to any destination within the U.S. It can be shipped on any date requested, between January 15 and October 31. A new contest will be held each week, so enter weekly! The winner was picked from 12,061 entered contestants! If you have previously entered our contest, you may click "Enter Contest" after entering your e-mail address. Please send me a current O&H Danish Bakery catalog. OFFICIAL RULES: No purchase necessary to enter or win. No responsibility is assumed for late, damaged or misdirected entries. Only one entry per e-mail address per week is allowed. O&H Danish Bakery employees and their immediate family members are not eligible to win. A winner will be randomly selected weekly. The winner will be notified by e-mail of the contest results. 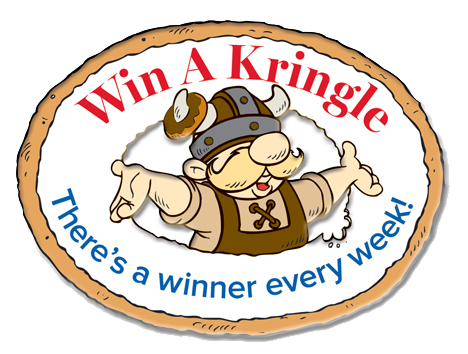 Please visit our Win A Kringle page to see who won last weeks contest. Odds of winning depend upon the number of entries received. O&H Danish Bakery will agree to ship at no charge to the winner one kringle of their choice to any address within the United States. Sorry, we are unable to ship to APO or FPO addresses. O&H Danish Bakery decisions concerning all matters related to this contest are final. The winner releases O&H Danish Bakery from any liability arising out of participation in this contest or the acceptance, use or misuse of the prize.